Deep muscles of the neck (not illustrated) are responsible for swallowing. Superficial muscles of the neck move the head (see Table 7.2 and Figure 7.13). Swallowing is an important activity that begins after we chew our food. First, the tongue (a muscle) and the buccinators squeeze the food back along the roof of the mouth toward the pharynx. An important bone that functions in swallowing is the hyoid. The hyoid is the only bone in the body that does not articulate with another bone. Muscles that lie superior to the hyoid, called the suprahyoid muscles, and muscles that lie inferior to the hyoid, called the infrahyoid muscles, move the hyoid. These muscles lie deep in the neck and are not illustrated in Figure 7.13. The suprahyoid muscles pull the hyoid forward and upward toward the mandible. Because the hyoid is attached to the larynx, this pulls the larynx upward and forward. The epiglottis now lies over the glottis and closes the respiratory passages. Small palatini muscles (not illustrated) pull the soft palate backward, closing off the nasal passages. Pharyngeal constrictor muscles (not illustrated) push the bolus of food into the pharynx, which widens when the suprahyoid muscles move the hyoid. The hyoid bone and larynx are returned to their original positions by the infrahyoid muscles. Notice that the suprahyoid and infrahyoid muscles are antagonists. Two muscles in the neck are of particular interest: The sternocleidomastoid and the trapezius are listed in Table 7.2 and illustrated in Figure 7.13. Recall that flexion is a movement that closes the angle at a joint and extension is a movement that increases the angle at a joint. Recall that abduction is a movement away from the midline of the body, while adduction is a movement toward the midline. Also, rotation is the movement of a part around its own axis. the opposite side. If you turn your head to the right, you can see how the left sternocleidomastoid shortens, pulling the head to the right. Each trapezius muscle is triangular, but together, they take on a diamond or trapezoid shape. The origin of a trapezius is at the base of the skull. Its insertion is on a clavicle and scapula. You would expect the trapezius muscles to move the scapulae, and they do. They adduct the scapulae when the shoulders are shrugged or pulled back. The trapezius muscles also help extend the head, however. The prime movers for head extension are actually deep to the trapezius and not illustrated in Figure 7.13. The muscles of the trunk are listed in Table 7.3 and illustrated in Figure 7.14. 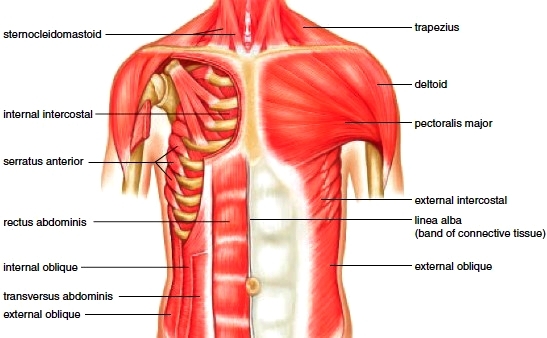 The muscles of the thoracic wall are primarily involved in breathing. The muscles of the abdominal wall protect and support the organs within the abdominal cavity. External intercostal muscles occur between the ribs; they originate on a superior rib and insert on an inferior rib. These muscles elevate the rib cage during the inspiration phase of breathing. The diaphragm is a dome-shaped muscle that, as you know, separates the thoracic cavity from the abdominal cavity (see Fig. 1.5). Contraction of the diaphragm also assists inspiration. Internal intercostal muscles originate on an inferior rib and insert on a superior rib. These muscles depress the rib cage and contract only during a forced expiration. Normal expiration does not require muscular action. Figure 7.14 Muscles of the anterior shoulder and trunk. The right pectoralismajor is removed to show the deep muscles of the chest. The abdominal wall has no bony reinforcement (Fig. 7.14). The wall is strengthened by four pairs of muscles that run at angles to one another. The external and internal obliques and the transversus abdominis occur laterally, but the fasciae of these muscle pairs meet at the midline of the body, forming a tendinous area called the linea alba. The rectus abdominis is a superficial medial pair of muscles. All of the muscle pairs of the abdominal wall compress the abdominal cavity and support and protect the organs within the abdominal cavity. External and internal obliques occur on a slant and are at right angles to one another between the lower ribs and the pelvic girdle. The external obliques are superior to the internal obliques. These muscles also aid trunk rotation and lateral flexion. Transversus abdominis, deep to the obliques, extends horizontally across the abdomen. The obliques and the transversus abdominis are synergistic muscles. Rectus abdominis has a straplike appearance but takes its name from the fact that it runs straight (rectus means straight) up from the pubic bones to the ribs and sternum. These muscles also help flex and rotate the lumbar portion of the vertebral column.